Pair is a unique social networking app for your iPod touch and iPhone from TenthBit Inc. While most social based iPhone applications are about putting us in touch with as many people as possible, Pair is an intimate social networking connection just for you and your significant other. In this review, we’ll cover some of the features of the Pair iOS app and what makes it unique. When in a relationship, most people like to share constant texts, emails and phone calls. Pair makes it easy to do all of this, plus share videos, links, and other information with your boyfriend, girlfriend, wife, or husband. Pair is a simply app to use. Almost everything you do here only requires a few taps. To start up, you simply enter your email and name and record a small invitation video for your significant other. The link and video is automatically delivered to them. Once you’re connected, you can easily share videos, chat and share other information. The system also keeps track of anniversaries, birthdays and other important information about your relationship. Your data is password protected and you can perhaps also save some money in the long run if you are currently texting back and forth a lot on a daily basis. You can also save time by quickly sharing your location through Pair. Once you and your partner are “paired” the app shows you a little status message on top that tells you what state they are in. For example “minimized app, or typing”. Tap the glowing white icon on the top to initiate a FaceTime call. A couple of very unique features of Pair are the Sketch Together and the Thumb Kiss which both add a personal and fun touch to your cyber love stream. To do a thumb kiss, you and your partner both place your thumbs on the iPhone screen. Once both of your thumbs match up on the same position on the screen, your iPhones vibrate and the screen turns red, and you’ve now thumb-kissed each other. It’s a little weird but fun, and feels like those beepers at restaurants. If you’ve ever played Draw Something, you’ll love the sketch feature in Pair, where you and your loved one can work together to co-draw sketches and or create tasks & manage a collaborative to-do list. Finally, in Pair you have the option of sending quick “pokes” to your partner using a “thinking of you” button throughout the day. A lot of people can’t seem to find the Thumb Kiss area in Pair, since it is sort of hidden. To get to it tap the action button which is the + icon. Then you can scroll to the right by swiping on the action bar and the buttons slide left. Once you slide right you’ll find 3 additional action icons for starting a Thumbkiss session, and also for sending your location and doing a Live Sketch together. To save a photo your partner has posted on your timeline for offline viewing, just tap and hold the photo, then from the pop-up menu choose “Save to Photos”. This app helps promote the bonds that exist in a good relationship with a loved one. I also like that it gives you a timeline, and documents everything you’ve said and done to each other all in one place. My wife and I have huge archives of emails and printouts from when we were dating. Something like Pair would have made it easier to go back and look at that data. While writing this review, I couldn’t help but think how useful this iPhone app could be to those in a long distance relationship. It makes staying in touch and sharing easy. 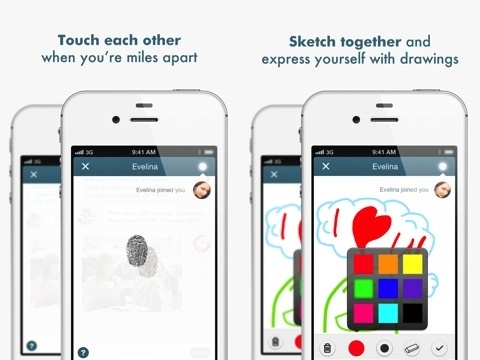 Instead of using several different programs to share different types of media, Pair puts it all in one simple iPhone app. The interface of Pair is simple and functional. Everything you need is right at your fingertips. If you have used Skype or Facebook, you’ll feel at home in this interface as well. What’s great about Pair is that your conversations are in a one to one private setting. Occasionally, the application seems to spin its wheels a bit longer than you’d like. You may wonder what exactly its doing. Keep in mind that videos and graphics are often being uploaded and sent to your partner. These actions do take time. Here are some of the features that Pair lacks that could honestly make a must have app. While the tasks feature is great, it would be great to be able to include your existing calendars from iCloud and Google into Pair. It would be nice to be able to delete older posts from the timeline including photos and videos. For local couples, recommendations for things to do locally could be an idea. And for those who are in long distance relationships, it would be cute if a countdown timer showed when you would next see each other. A few users have been noting technical connection issues while the app is trying to “pair” itself with your partner, which we did not run into but is a sign of an area that could use improvement. Push notifications for when you get a thumb kiss or sketch would be amazing. Finally, since Pair is only available on the iPhone, if one of you doesn’t have one you can’t use this service. It would be great if there was an Android version of Pair or maybe even a web based alternative for those who don’t own an Apple mobile device yet. 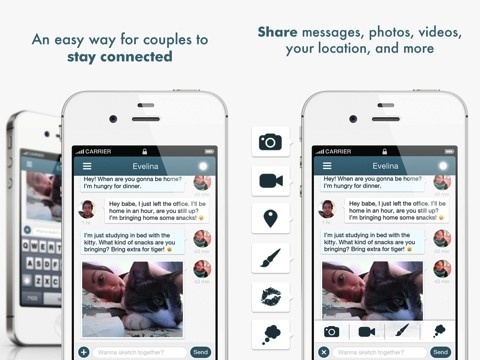 The high value of this app is obvious to anyone in a relationship. Since it works with an iPod touch as well as the iPhone, users without an iPhone can still use a Wi-Fi connection to communicate via their touch device. I’d highly recommend this application for couples of all ages, especially for couples in long distant relationships, the military included. It may end up being an app that you use on a daily basis. AppSafari review of Pair was written by Darius Reimm on April 2nd, 2012 and categorized under App Store, Dating, Featured, Free, Social. Page viewed 6487 times, 2 so far today. Need help on using these apps? Please read the Help Page.